Francesco Paoli’s award winning prints are all available in a limited edition, signed by hand on front, serialized and supplied with a certificate of authenticity with holographic stamp also signed by the author. The fine art prints are produced using the best professional photographic paper available on the market, the Fujiflex Crystal Archive. 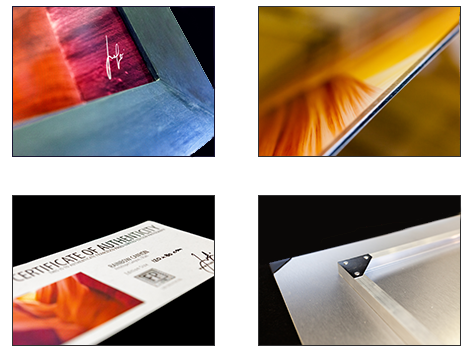 Each print is front mounted on acrylic glass through process Diasec® back mounted on dibond brushed aluminum, to ensure maximum rigidity and durability over the years. The use of Fuji Flex Crystal Archive paper under acrylic glass makes it possible to achive outstanding results, enhancing color saturation, contrast and providing outstanding image brightness and intensity. This solution can guarantee an incredible resolution of the fine details otherwise not possible using other materials, protecting the prints from scratches, dirt, UV rays and preventing any alteration over the years. Each print is shipped with an aluminum frame on the back ready to hang; it is also possible to choose between a wide range of frames. Each frame is unique: it is produced, assembled and painted by hand in Italy, and customized for each single photo.